To improve access to undergraduate research experiences in the area of trauma for groups typically underrepresented in this research, including veterans, a collaborative venture between the Falk College, SUNY Oswego and SUNY Upstate Medical University is now recruiting students for its 2015 program June 1-26 on the Syracuse campus. Undergraduate Trauma Research Training aims to improve access to undergraduate research experience for underrepresented groups, including veterans. The Undergraduate Trauma Research Training program is a National Science Foundation (NSF) Research Education for Undergraduates (REU) opportunity directed by Brooks B. Gump, Falk Family Endowed Professor of Public Health, and co-directed by Karen Wolford, professor in the Department of Psychology and coordinator of the Interdisciplinary Graduate Certificate Program in Trauma Studies at SUNY Oswego. It also includes other faculty from these institutions as well as SUNY Upstate Medical University. This program brings together veterans and non-veterans in a safe environment to pursue trauma research activities. 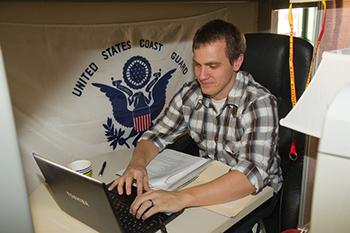 Veterans are included both as students learning research skills and as research subjects. This month-long immersion program involves coursework, mentored student-faculty interactions and the development of a research project. Participating students receive a $3,000 stipend for attending the summer session. Room and board are provided free of charge, as needed, with some travel cost assistance available for out-of-state participants. The program, now in its fourth year, draws on personal experiences of veterans who understand the nature and context of traumatic events. By gaining a scientific understanding of trauma, students who complete the program gain essential tools they can use to improve the quality of life for themselves and others, including veterans. Read more about one REU participant’s experience here. The program is purposefully structured to span one full year. Following the summer program, students continue their research under the mentorship of REU faculty during the fall semester. Finally, students are expected to present their research at a national or international conference in Spring, 2016. The travel and registration expense for the conference is provided to the student through this program. For more information about the program, and to download an application for it, visit the Syracuse University REU web site or contact Ivan Castro at 443-5899 or iecastro@syr.edu. The application deadline is April 15.